2013 VW Polo 1.2 R-Line Style review | What Car? The Volkswagen Polo R-Line Style offers exactly what its name suggests: the sporty looks of the R-Line without the extra equipment, bigger engine or considerably higher price tag. The Style is based on the Polo S, but gets an R-Line body kit (body-coloured bumpers, side skirts and radiator grille with R-Line badging). The Style also gets body-coloured door handles and mirrors, 16-inch ‘Rivazza’ alloy wheels and a rather aftermarket-looking Bluetooth kit mounted on the dashboard. Where the Style differs most from its bigger R-Line brother is in the choice of engines: it's available with either a 1.2-litre 59bhp or a 1.2-litre 69bhp petrol engine, whereas the full-fat R-Line gets a torquier and smoother 104bhp turbo petrol. 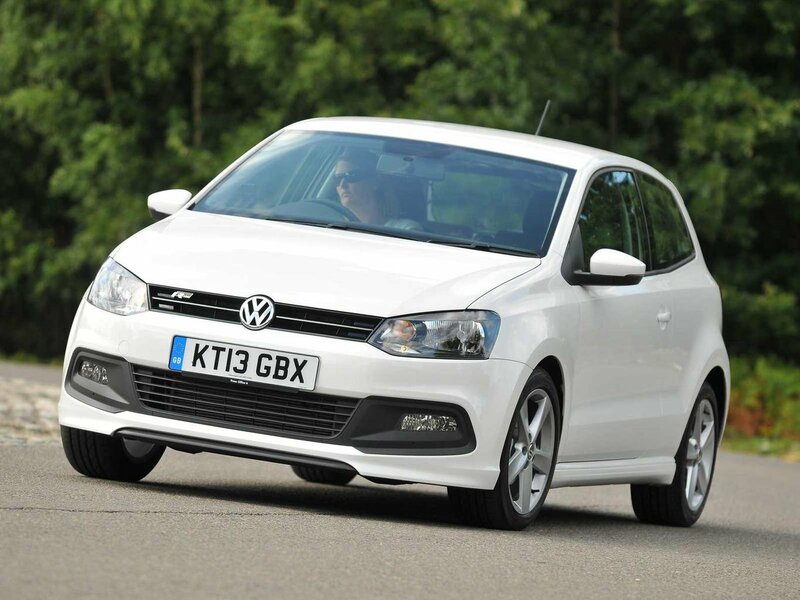 What's the 2013 Volkswagen Polo 1.2 R-Line Style like to drive? Noisy. We tested the Style with the entry-level 59bhp engine, and the cacophany only gets worse the faster you go. This engine feels underpowered when you work it through the gears, but the 69bhp version isn't worth the extra £875 as it's only slightly stronger. Even in the lower-powered engine, the power delivery is fairly linear, and it's relatively easy to keep up with motorway traffic. Unfortunately, you do feel a lot of engine vibration through the pedals at all speeds. Despite those relatively big alloys, the Style damps most bumps pretty well. Normal road imperfections aren’t as noticeable as you might expect, while even potholes fail to upset the Polo. The steering is light and responsive, and although there’s obvious body roll, the Polo never lurches around uncontrollably. The five-speed manual gearbox is precise, and the predictable throttle response and light clutch make the Style easy to drive in town. What's the 2013 Volkswagen Polo 1.2 R-Line Style like inside? Perceived quality is something every Polo does well, and the Style is no exception. The dashboard is nicely designed with a fuss-free centre console. The plastics feel suitably expensive and there's some nice gloss black detailing. Electric front windows, stability control and front and side airbags are standard, along with front foglights. The Style also comes with manual air-con as an option (like the Polo S), but this costs a hefty £715. The driver’s seat is height-adjustable, and most people will find it easy to get comfortable, although taller drivers will find the steering wheel a little too far away. A multi-function leather steering wheel is available as a £185 option. Central locking is also included, but annoyingly isn’t remote; you’re stuck with a clunky key-in-the-door operation instead. On the plus side, you do get a DAB radio with a 3.5mm aux-in socket for your MP3 player. However, the Bluetooth phone kit isn’t as impressive; it's complicated to use and the sound quality isn't great. The manually adjustable door mirrors are also fiddly to adjust, especially if you're reaching over to adjust the one on the passenger side. There’s a reasonable amount of room in the back for passengers, though, and if you need more boot space than the standard seats-up 280 litres, the rear seatbacks fold down to increase capacity to 980 litres. If sporty visual touches are important, then the new R-Line Style has obvious appeal – especially for younger drivers, as the less powerful petrol engines are cheaper to insure than the 1.2 turbo in the full R-Line model. Prices start at £11,900 (for a three-door, 59bhp model), while a five-door, 69bhp version with air-conditioning will set you back £14,110 – that's still a fair bit less than you'd pay for a three-door R-Line. However, if the R-Line styling isn’t crucial, we'd point you in the direction of the Polo Match Edition, which comes with a bigger range of petrol and diesel engines. The same entry-level 59bhp 1.2 petrol engine in that car will cost you £12,045 and that includes air-con, 15-inch alloys, tinted rear windows, remote central locking, rear parking sensors, cruise control, and electrically adjustable door mirrors.